Could the Chicago River be home to the Windy City's next big transit idea? Worldwide icon-chevron-right North America icon-chevron-right United States icon-chevron-right Illinois icon-chevron-right Chicago icon-chevron-right Could the Chicago River be home to the Windy City's next big transit idea? Sometimes referred to as the nation’s third coast, Chicago’s 22 miles of Lake Michigan waterfront, with its sandy beaches and sailboat harbors, is often a surprise for visitors to the inland metropolis. While the lake played a pivotal role in Chicago’s industrial legacy, the lesser-appreciated Chicago River is becoming a vital asset to the city’s economic rebound. And it could just become an emerging leader in public transit if water taxis take over. Long reviled for being a toxic waterway—the river still has issues with bacteria from the city’s sewage system—the waterway does boast some good news. Decades of advocacy and investments have not only seen a vast improvements in the Chicago River’s water quality (save for the aforementioned caveat), but also the river’s transition into a key tourist attraction and place for recreation. The recently completed Chicago Riverwalk extension, major new mixed-use developments and corporate relocations are drawing more and more people to riverfront. This all creates a need to further expand Chicago’s public transportation system. A water taxi service already runs along the river’s three branches, ferrying commuters from Chicago’s train stations on the western edge of the Loop to the Michigan Avenue Bridge. Privately owned and operated by Wendella Boats, Chicago Water Taxi is planning an expansion that would connect more neighborhoods and attractions. Currently, the company stops at seven locations in and around Chicago’s downtown, but more stops are on the way. 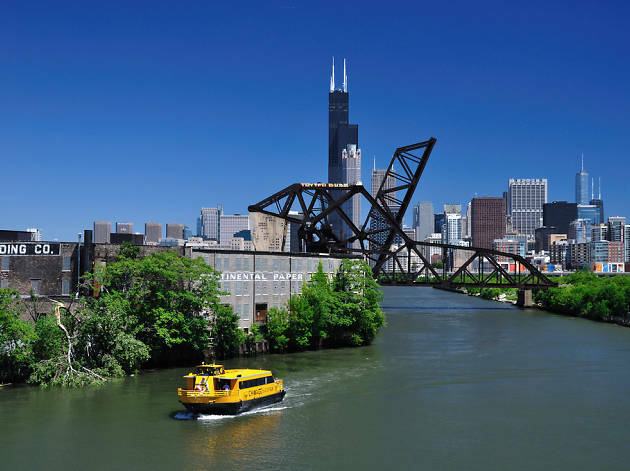 Sargis explains that the Chicago River water taxi service, which functions more like a shuttle with stops along a predetermined route, launched in 2001 as the Wendella River Bus. 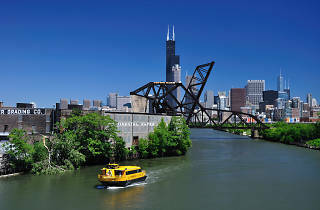 In 2007, the company rebranded the system as the Chicago Water Taxi and painted its vessels in the iconic yellow and black color scheme to help identify the small fleet as a transportation service. Last year, the service transported 400,000 passengers, Sargis says. While the water taxi operates independently from the city’s vast public transit system, Sargis makes the case that that the integrating the Ventra electronic fare payment card and mobile app used by Metra commuter rail and Chicago Transit Authority trains and buses, is a crucial next step for longterm growth and ridership. And as far as Uber and Lyft models are concerned? Sargis says that an on-demand boat service is not likely. However, making water taxi tickets easier to buy and use, as well as partnering with corporate enterprise accounts, would likely lead to more people to view the service as a viable means of transportation. At least that’s the hope, Sargis says. “What’s happening in Chicago is indicative to what is happening around the country,” adds Sargis. “There are huge benefits for local water taxi services because people are finally taking it seriously as a meaningful and affordable transit solution.” Here’s hoping locals think the idea has (sea) legs, too.